Today Wrigley candy giant Skittles announced that it will be “Skittlizing the Big Game” for Super Bowl LI by way of a new campaign created by adam&eveDDB. This marks the third consecutive year in which Skittles has bought air time during the Super Bowl. The brand made its Big Game debut in 2015 with “Settle It,” a spot about a town fixated on the lost art of arm wrestling. Last year, Aerosmith’s Steven Tyler scored a starring role in “The Portrait,” with the titular image made entirely of Skittles. DDB Chicago was the creative agency behind both efforts, with the client producing an array of teasers starring such unlikely brand advocates as notoriously press shy Seattle Seahawks running back Marshawn Lynch, former quarterback Kurt Warner and Broncos linebacker-turned amateur weatherman DeMarcus Ware. A Wrigley representative has declined to provide any teasers or hints regarding the creative direction of the campaign or the parent company’s decision to go with the London-based adam&eveDDB. That network’s best-known work may be a series of Christmas spots for hometown retailer John Lewis. It has, however, worked with Skittles in the past, most prominently for an LGBT-oriented campaign in which the candy dropped its famous colors in honor of this summer’s London Pride parade. The latest “Taste the Rainbow” spot will air during the game on Feb. 5. 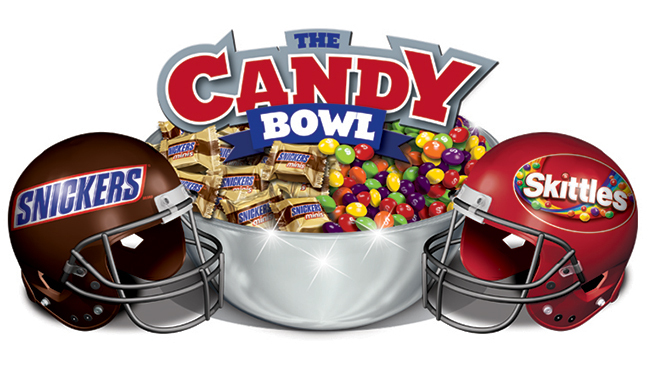 In the meantime, Skittles and Snickers have paired up for an in-store promotion under the “Candy Bowl” theme.